11 Selma Alabama June 19th 1865 Monday Relieved from Picket duty this Morning. Collected from Co. C. $ 100,00 of their an subscription to the Orphans Asylum for the State of Iowa, gave receipts to the men. and turned the money over to F. Humphrey Chaplain of 12th Regt Iowa Infty and took receipt for the same as He is Collecter for the Regt. 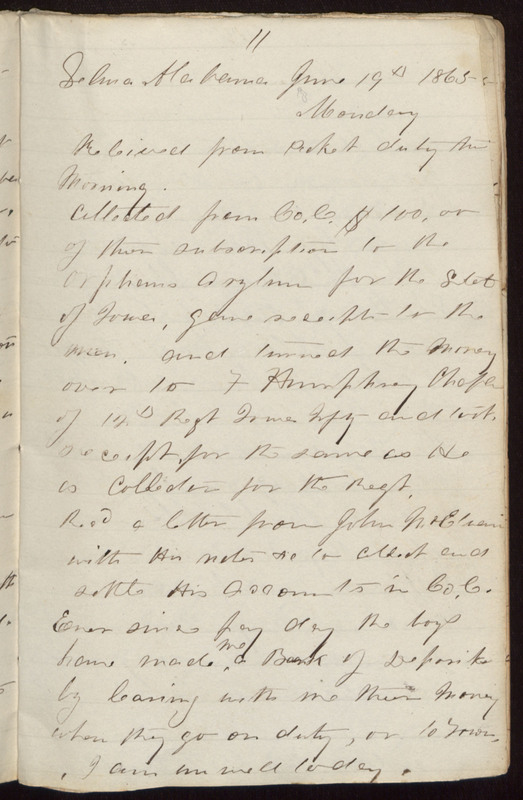 Recd a letter from John McElvain with His notes &c to Collect and settle His Accounts in Co. C. Ever since pay day the boys have made me a Bank of Deposits by leaving with me their money when they go on duty, or to Town, I am un well today.